Join herbalists Lara Pacheco and Kate Coulton as we craft with natural dyeing and nourish with seasonal medicine making to bring us into the brighter and expansive months of the year. Lunch will be provided by Chef, Paige Common from Eatin Alive. Each participant will learn some basic steps of dyeing with plants and will be able to personalize their own dye bath for a skein of wool yarn. Folks will also leave with a tea blend that we will make as well. There will be an optional Meet&Greet (and optional lesson on how to prepare your fiber/wool for dye) on Friday, May24th from 6:30pm-7:30pm at the Sou'wester in the lodge living room. 11-3pm. Kate Coulton of Pinion Botanicals and Lara Pacheco of Seed and Thistle Apothecary offer customized experiences around connecting folks to plant medicine, body and land. They do this through education and herbal crafting. Lara and Kate also offer a 11 month herbal apprenticeship program that delves deeper into these connections and supports folks in tapping into their ancestral medicine. Paige Common started preparing plant-based foods in her Portland kitchen giving life to Eatin' Alive in 2010. Detroit born and bred, soulful living inspires this gal: healthy diets, hearty laughter and active lifestyle. She believes that a rainbow a day will keep the doctor away. Paige is available for one-on-one health coaching, recipe development, pre/post-natal consultations, small event catering, speaking engagements and classes. BRING: All supplies provided in addition to a catered lunch. Coffee and tea provided. Please wear clothes & shoes that are ok to get dye on. Optional Meet&Greet (and optional lesson on how to prepare your fiber/wool for dye) on Friday May 24th from 6:30pm-7:30pm at the Sou'wester in the lodge living room. All skill levels welcome. 20 students max. This class is part of the Spring/Summer 2019 Workshop Series. All classes are open to the public and all skill levels welcome. Visit www.souwesterlodge.com/calendar to see the full schedule of artist-led workshops. In this program we will work with easily cultivated plants and realize the powerful relationship and ally ship we can have with medicine that supports our bodily systems and spirit. Each Monday we will harvest some plants that we will work into medicine that participants can take home. We will also have one Wednesday to do a plant walk. The day will also include tea and a lunch of a basic soup and grain that we will work together to create from the garden. Folks are encouraged to bring extra snacks if they feel like their body needs it. Dates we meet: June 10th, 17th, 24th, July 8th, 15th with Plant Walk on June 19th with a 10-2pm time frame. We will meet in the backyard studio every day with the exception of the plant walk. Tuition: $400-$250. Payment plans available with a 100$ deposit. No work trade available. 1 Partial scholarships available depending on registration. No work trade available. Registration here. Cost: $30 per person, 15 students max. Event page and additional details available here. Chef and Owner of Eatin Alive, Paige Common and Clinical Herbalist, Lara Pacheco of Seed and Thistle will lead participants through a hands on workshop to learn how to prepare for the Winter season. Attendees will make elderberry syrups and fire cider to take home while learning the folkore and medicinal uses of this age old medicine. Paige will nourish us with a hearty, warming lunch while we also prepare broths to deepen the support for our immune systems in the coming cold and flu season. Join us to welcome in the Autumn air as the coastal seasons shift. Detroit born and bred, soulful living inspires this gal: healthy diets, hearty laughter and active lifestyle. Paige stated preparing plant-based foods in her Portland kitchen giving life to Eatin’ Alive in 2010. She believes that a rainbow a day will keep the doctor away. Paige is available for one-on-one health coaching, recipe development, pre/post-natal consultations, small event catering, speaking engagements and classes. BRING: Please bring notebooks and pens to take notes. Hot tea and coffee provided. Lunch is provided by chef, Paige Common. Join Lara Pacheco of Seed and Thistle Apothecary and Paige Common of Eatin Alive for our annual Wild Forage Retreat in the Woods at Big Bear Camp for the weekend of March 17th-19th. We'll use this time in a sacred place near the forest to connect with the emerging plants of the season that help us transition from Winter Stagnation to Spring movement and that nourish us while we adjust to the seasons. We will learn medicinal properties and preparations of the wild plants we forage and Paige will feed and lead us through some nourishing food recipes. We'll gather to ground with gentle yoga and be intentional in helping us to connect our awareness to our bodies, the landscape, elements and season. Enjoy 80 acres of forest tucked in its own little valley in the Siuslaw watershed, about 30 miles west of Eugene, Oregon. Big Bear offers and unique combination of accomodation from a comfortable lodge, furnished yurts to improved tent camping. Calling mothers of all types (aunties, guardians, godmothers, mentors) and daughters to gather with Rewild Portland and Seed & Thistle Apothecary as we hold space together and set intentions of connecting with the heart. Participants will craft herbs into chocolates, tea blends, salves, lotions, and other self care preparations from medicinal herbs. As we create the space to nurture the mother/daughter dynamic, we will also learn to honor self-care through self-love. We will be providing a hearty, vegetarian stew and there will be plenty of tea. Pack snacks if necessary. I'll be teaching again with the Portland Plant Medicine Gathering. How do we as herbalists help guide our female bodied youth to cultivate the wild within, while giving them tools to resist aparadigm thatseeks to dominate, normalize, commodify, and surrender the free feminine spirit? The confined parameters of power that plagued our ancestors for thousands of years continue today in different forms and begin with our youth. Join Lara Pacheco from Seed and Thistle Apothecary who will share her model of work and tools in the form of herbal youth programming to assist them in discovering plant allies while also developing an awareness of their bodies and the surrounding landscapes and elements. Herbs that we have worked with will be shared. Rather than shame and fear, Lara seeks to build a culture of love and respect for the mystical nature of the female body and the beauty in all young body types regardless of gender. This work has been her greatest avenues of hope in a continuing climate of fear and patriarchal power. Join Lara Pacheco of Seed and Thistle Apothecary as she explores the various ways we can help connect people to the surrounding landscapes, plants, and the healing potential of their bodies while also sustaining a small scale herbal business that aligns with your ethics and goals. She'll share the work she's been involved with in her neighborhood as a business women, community activist, and herbal medicine ambassador. She's also discuss models of educational programming and the latest project of starting a mobile herbal clinic, The Seasonal Wellness Collective, to help perpetuate herbalism as a model of empowerment and access. Also included will be a discussion of some vital plants to be a part and the drivers of this type of work. Join Eatin Alive and Seed and Thistle Apothecary for a Fall Retreat to nourish and deepen our roots in preparation for a Cold and Flu Winter Season. Gather around the fire and cozy up at Big Bear Retreat in Walton, Oregon as we wildcraft, make elderberry syrup and cordials and learn some nourishing and warming recipes for Fall meals. Cost includes lodging, wild edibles cooking class, 4 meals (2 breakfasts + 2 dinners) and medicine to take home. Enjoy 80 acres of forest tucked in its own little valley in the Siuslaw watershed, about 30 miles west of Eugene, Oregon. Big Bear Camp is rustic and cozy especially in the winter/spring months. The main lodge has a pullout bed, sleeping pads and cots to sleep on. The main lodge is heated + it has a wood burning fireplace. The yurt will be used for light yoga and meditation heated by a wood burning stove. Tent camping is also an option however it may be rainy in October. If you do decide to camp there are plenty of cots and sleeping mats to make your sleeping experience a bit more comfortable. There is also a covered structure that you can camp under. Whatever sleeping arrangement you choose we will make sure to keep the fire stoked for a cozy experience. I have the honor of teaching at this year's 30th Breitenbush Herbal Conference with the theme of 'Herbalism is for Everyone: Passionate Healing'. The Breitenbush Herbal Conference is an annual gathering for herbalists and healers of all kinds. People come from all corners to celebrate and learn from some of the most inspiring teachers in our herbal community. The healing waters and ancient forests of Breitenbush provide an unforgettable setting for this gathering. Workshops, demonstrations and herb walks appeal to all levels of students. Fine handmade goods and books are available in the Herbal Marketplace. Much joy and laughter is to be shared during the Talent Show and Raffle. One can also take a hike along one of the forest trails, a meditative walk through the large labyrinth, start the morning with an energizing yoga practice or receive a healing massage after a day of soaking in the sacred springs. Join me in welcoming in the summer by learning to cultivate and use homegrown medicinal herbs at the Flying Coyote Farm in Sandy, OR. In this class students will learn about the medicinal properties of Calendula, Motherwort, Marshmallow, and Yarrow, four herbs that can be easily cultivated in your home garden. We will use the medicinal herb gardens on the farm to learn the best growing, harvesting and processing techniques for each plant and why learning to grow your own medicine can be a wonderful way to invite herbs into your home. In the second half of the class students will participate in making an infused calendula oil and a yarrow tincture while learning about simple medicine making techniques and how to transform home grown herbs into powerful medicine. Register here. Students will leave with the confidence to begin growing and making their own medicine at home as well as a transplant of each herb to help get their medicinal garden started. 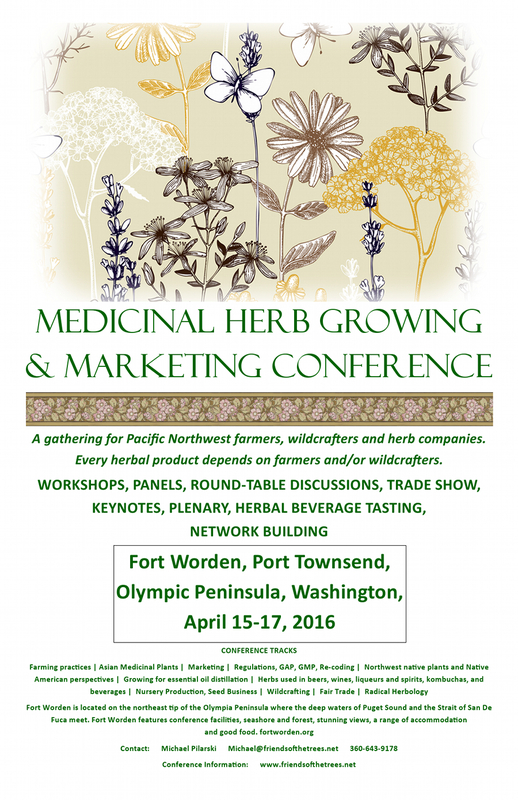 Please join me to teach this class and help lead a round table discussion of Radical Herbology at the First Medicinal Herb Growing and Marketing Conference in beautiful Fort Warden, Washington for the weekend of April 15th-17th, 2016. Please take a look at the flier below and at www.friendsofthetrees.net for more information and registration. Join Lara Pacheco of Seed and Thistle Apothecary as we embrace Winter by learning how to nourish + prepare our hearts, bodies, and minds for the short days and long nights that the approaching winter solstice will bring. We will explore the folklore of Winter and traditional practices that nourish and provide deep immune support. We will prepare elderberry syrup, share bone broth recipes, and explore medicinal roots that we can incorporate into winter cooking to help maximize health. All participants will take home a 2 oz. bottle of the syrup we make together. I'll be teaching again, so please join me at the Portland Plant Medicine Gathering! Join me as I teach the Herbal Infusions Class as part of the Backyard Series and the Elderberry Syrup and Fire Cider classes as part of the Cold & Flu Series that take place at the Blendily shop! More information on the flyer below! There will be information on another event on March 21st related to food, foraging, bikes and spring greens and their medicinal virtues. Stay tuned!